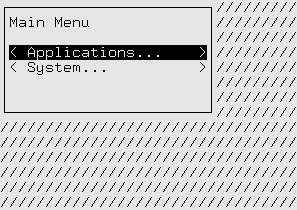 This program displays the string Hello World in the top left corner of the screen and will run until interrupted with CTRL+C (^C). The txt Text widget handles formatting blocks of text, wrapping to the next line when necessary. Widgets like this are called “flow widgets” because their sizing can have a number of columns given, in this case the full screen width, then they will flow to fill as many rows as necessary. The fill Filler widget fills in blank lines above or below flow widgets so that they can be displayed in a fixed number of rows. This Filler will align our Text to the top of the screen, filling all the rows below with blank lines. Widgets which are given both the number of columns and number of rows they must be displayed in are called “box widgets”. The MainLoop class handles displaying our widgets as well as accepting input from the user. The widget passed to MainLoop is called the “topmost” widget. The topmost widget is used to render the whole screen and so it must be a box widget. In this case our widgets can’t handle any user input so we need to interrupt the program to exit with ^C. This program initially displays the string Hello World, then it displays each key pressed, exiting when the user presses Q. The MainLoop class has an optional function parameter unhandled_input. This function will be called once for each keypress that is not handled by the widgets being displayed. 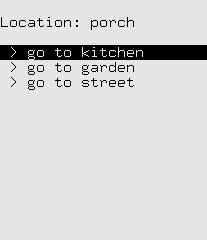 Since none of the widgets being displayed here handle input, every key the user presses will be passed to the show_or_exit function. The ExitMainLoop exception is used to exit cleanly from the MainLoop.run() function when the user presses Q. All other input is displayed by replacing the current Text widget’s content. This program displays the string Hello World in the center of the screen. It uses different attributes for the text, the space on either side of the text and the space above and below the text. It waits for a keypress before exiting. The screenshots above show how these widgets react to being resized. A Text widget is created containing the string " Hello World " with display attribute 'banner'. The attributes of text in a Text widget is set by using a (attribute, text) tuple instead of a simple text string. Display attributes will flow with the text, and multiple display attributes may be specified by combining tuples into a list. This format is called Text Markup. An AttrMap widget is created to wrap the text widget with display attribute 'streak'. AttrMap widgets allow you to map any display attribute to any other display attribute, but by default they will set the display attribute of everything that does not already have a display attribute. In this case the text has an attribute, so only the areas around the text used for alignment will be have the new attribute. A second AttrMap widget is created to wrap the Filler widget with attribute 'bg'. When this program is run you can now clearly see the separation of the text, the alignment around the text, and the filler above and below the text. This program displays the string Hello World in the center of the screen. It uses a number of 256-color-mode colors to decorate the text, and will work in any terminal that supports 256-color mode. It will exit when Q is pressed. This palette only defines values for the high color foregroundand backgrounds, because only the high colors will be used. A real application should define values for all the modes in their palette. Valid foreground, background and setting values are documented in Foreground and Background Settings. Behind the scenes our MainLoop class has created a raw_display.Screen object for drawing the screen. The program is put into 256-color mode by using the screen object’s set_terminal_properties() method. This example also demonstrates how you can build the widgets to display in a top-down order instead of the usual bottom-up order. In some places we need to use a placeholder widget because we must provide a widget before the correct one has been created. We change the topmost widget used by the MainLoop by assigning to its MainLoop.widget property. Decoration Widgets like AttrMap have an original_widget property that we can assign to change the widget they wrap. Divider widgets are used to create blank lines, colored with AttrMap. 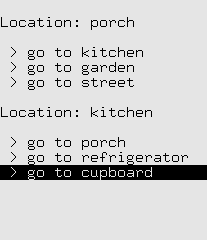 Container Widgets like Pile have a contents property that we can treat like a list of (widget, options) tuples. Pile.contents supports normal list operations including append() to add child widgets. 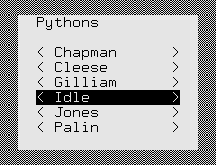 Pile.options() is used to generate the default options for the new child widgets. 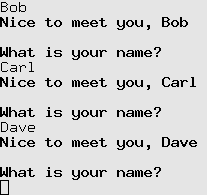 This program asks for your name then responds Nice to meet you, (your name). The Edit widget is based on the Text widget but it accepts keyboard input for entering text, making corrections and moving the cursor around with the HOME, END and arrow keys. Here we are customizing the Filler decoration widget that is holding our Edit widget by subclassing it and defining a new keypress() method. Customizing decoration or container widgets to handle input this way is a common pattern in Urwid applications. This pattern is easier to maintain and extend than handling all special input in an unhandled_input function. In QuestionBox.keypress() all keypresses except ENTER are passed along to the default Filler.keypress() which sends them to the child Edit.keypress() method. 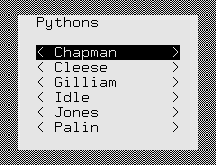 Note that names containing Q can be entered into the Edit widget without causing the program to exit because Edit.keypress() indicates that it has handled the key by returning None. See Widget.keypress() for more information. When ENTER is pressed the child widget original_widget is changed to a Text widget. Text widgets don’t handle any keyboard input so all input ends up in the unhandled_input function exit_on_q, allowing the user to exit the program. 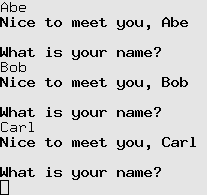 This program asks for your name and responds Nice to meet you, (your name) while you type your name. Press DOWN then SPACE or ENTER to exit. An Edit widget and a Text reply widget are created, like in the previous example. The connect_signal() function is used to attach our on_ask_change() function to our Edit widget’s 'change' signal. Now any time the content of the Edit widget changes on_ask_change() will be called and passed the new content. Finally we attach our on_exit_clicked() function to our exit Button’s 'click' signal. on_ask_change() updates the reply text as the user enters their name and on_exit_click() exits. 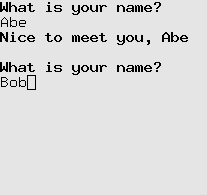 This program asks for your name and responds Nice to meet you, (your name). It then asks again, and again. Old values may be changed and the responses will be updated when you press ENTER. ENTER on a blank line exits. ListBox widgets let you scroll through a number of flow widgets vertically. It handles UP, DOWN, PAGE UP and PAGE DOWN keystrokes and changing the focus for you. ListBox Contents are managed by a “list walker”, one of the list walkers that is easiest to use is SimpleFocusListWalker. SimpleFocusListWalker is like a normal python list of widgets, but any time you insert or remove widgets the focus position is updated automatically. Here we are customizing our ListBox’s keypress handling by overriding it in a subclass. The question() function is used to build widgets to communicate with the user. Here we return a Pile widget with a single Edit widget to start. We retrieve the name entered with ListBox.focus to get the Pile in focus, the standard container widget method  to get the first child of the pile and Edit.edit_text to get the user-entered text. For the response we use the fact that we can treat Pile.contents like a list of (widget, options) tuples to create or replace any existing response by assigning a one-tuple list to contents[1:]. We create the default options using Pile.options(). To add another question after the current one we treat our SimpleFocusListWalker stored as ListBox.body like a normal list of widgets by calling insert(), then update the focus position to the widget we just created. We can create a very simple menu using a list of Button widgets. This program lets you choose an option then repeats what you chose. menu() builds a ListBox with a title and a sequence of Button widgets. 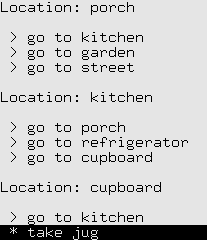 Each button has its 'click' signal attached to item_chosen, with item name is passed as data. The buttons are decorated with an AttrMap that applies a display attribute when a button is in focus. 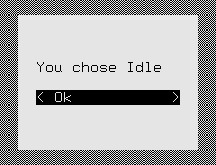 item_chosen() replaces the menu displayed with text indicating the users’ choice. exit_program() causes the program to exit on any keystroke. The menu is created and decorated with an Overlay using a SolidFill as the background. 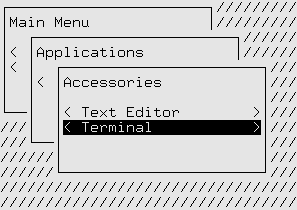 The Overlay is given a miniumum width and height but is allowed to expand to 60% of the available space if the user’s terminal window is large enough. A nested menu effect can be created by having some buttons open new menus. This program lets you choose an option from a nested menu that cascades across the screen. You may return to previous menus by pressing ESC. menu_button() returns an AttrMap-decorated Button and attaches a callback to its 'click' signal. This function is used for both sub-menus and final selection buttons. sub_menu() creates a menu button and a closure that will open the menu when that button is clicked. Notice that text markup is used to add '...' to the end of the caption passed to menu_button(). menu() builds a ListBox with a title and a sequence of widgets. item_chosen() displays the users’ choice similar to the previous example. menu_top is the top level menu with all of its child menus and options built using the functions above. This example introduces WidgetPlaceholder. WidgetPlaceholder is a decoration widget that does nothing to the widget it decorates. It is useful if you need a simple way to replace a widget that doesn’t involve knowing its position in a container, or in this case as a base class for a widget that will be replacing its own contents regularly. CascadingBoxes is a new widget that extends WidgetPlaceholder. It provides an open_box() method that displays a box widget box “on top of” all the previous content with an Overlay and a LineBox. The position of each successive box is shifted right and down from the previous one. CascadingBoxes.keypress() intercepts ESC keys to cause the current box to be removed and the previous one to be shown. 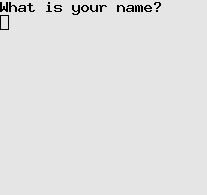 This allows the user to return to a previous menu level. This example is like the previous but new menus appear on the right and push old menus off the left side of the screen. The look of buttons and other menu elements are heavily customized and new widget classes are used instead of factory functions. MenuButton is a customized Button widget. Button uses WidgetWrap to create its appearance and this class replaces the display widget created by Button by the wrapped widget in self._w. SubMenu is implemented with a MenuButton but uses WidgetWrap to hide the implementation instead of inheriting from MenuButton. 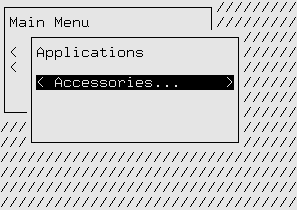 The constructor builds a widget for the menu that this button will open and stores it in self.menu. Choice is like SubMenu but displays the item chosen instead of another menu. The palette used in this example includes an entry with the special name None. The foreground and background specified in this entry are used as a default when no other display attribute is specified. 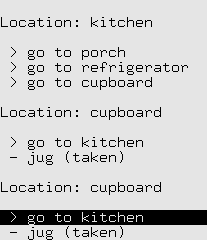 HorizontalBoxes arranges the menus displayed similar to the previous example. 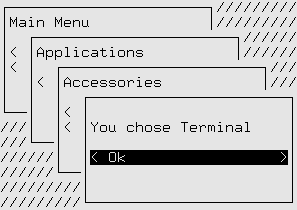 There is no special handling required for going to previous menus here because Columns already handles switching focus when LEFT or RIGHT is pressed. AttrMap with the focus_map dict is used to change the appearance of a number of the display attributes when a menu is in focus. We can use the same sort of code to build a simple adventure game. Instead of menus we have “places” and instead of submenus and parent menus we just have “exits”. This example scrolls previous places off the top of the screen, allowing you to scroll back to view but not interact with previous places. This example starts to show some separation between the application logic and the widgets that have been created. The AdventureGame class is responsible for all the changes that happen through the game and manages the topmost widget, but isn’t a widget itself. This is a good pattern to follow as your application grows larger.